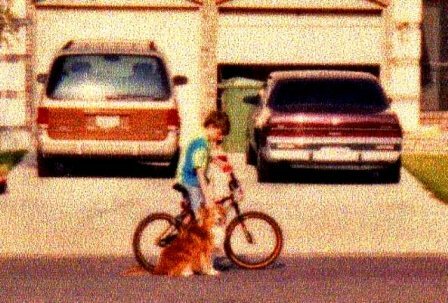 Growing up in Oklahoma dogs were always a part of my life. In addition to our family, my cousins, aunts, uncles, and grandparents had dogs of all kinds. 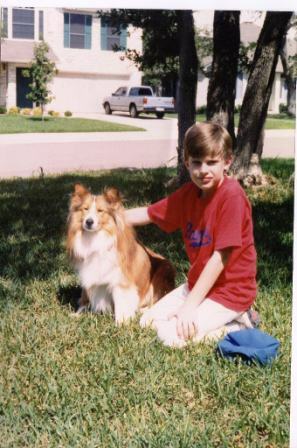 However it was not until much later in my life and living in Texas that I became aware of the Sheltie breed. My twin brother who still lived in Oklahoma purchased a beautiful Sheltie. He always commented on what great pets they were and how good they were with his three childern. Of course when we visited dogs were not the focus of our visits. I had been married for several years and had three childern of my own. In addition we had two "Heinz 57" dogs. While they were nice pets I was never able to teach them basic commands like sit. They went to the rainbow bridge within a six month period of each other. My wife wanted to wait awhile before we acquired another dog. Several months had passed and the boys and I were going to Oklahoma to visit my mother and family. My mother mentioned she had a young Sheltie puppy that no one wanted that she was keeping and suggested I "adopt" him. While I did not want to commit to anything until I saw him I promised my mother I would consider taking him home. After we arrived "Laddie" like a lot of Shelties was some what reserved and a little hesitant to approach us. The first thing I noticed about him was what a beautiful dog he was and the attention span he had compared to other dogs. Soon he warmed up to us and I knew I had to take him home with us. When we got back to Texas that first week, the kids and I "fell in love" with Laddie. My wife who had not completely gotten over the death of our other two dogs had not warmed up to him yet. Laddie had a way of "hugging people" by standing on his back legs and placing both of his front legs on each side of the person's head and giving them a kiss. I think he sensed that she had not warmed up to him like the rest of us and went over and gave her a Laddie hug and a kiss. Well of course he won her over as well. It was not until we arrived back in Texas that I realized what an exceptional dog he was. Shortly after we got back I answered the front door with Laddie. There were some childern that came over to visit my childern. I could not open the door because Laddie was blocking the way. Without thinking I said get back. Well he just backed right up like he knew exactly what I wanted. Soon I noticed that I could say things to him like a small child. He seemed to have some type of intuition like he knew what I always wanted. I began teaching him tricks and regardless of the type of trick he learned them in about 5 minutes. I think he knew about 10-12 tricks that I could ask him to do when someone visited. I would ask him to do the first one and he would proceed to do all of them without me even asking him to do the rest of them. One of the tricks that amazed people the most was that I taught him to count from one to ten. I would hold up any number of fingers between one and ten and he would bark until he had "accounted" for the correct number. Of course no one ever knew except Laddie and I that he did not really count the number of fingers but that he barked until I gave him a secret signal that only he and I knew, and then he stopped. There were many times after the childern finished playing in the front when the family sat down to dinner and I would ask "Where is Laddie?" I would go to the front door and there he would be, lying on the front door mat. He never ran off, but just waited until we opened the door. He lived to please me and the rest of the family. His birthday was just a few days before mine, but I always boasted to the kids that we had the same birthday and we celebrated them together. I am not sure my kids ever believed me, but it was a good story. One day after walking outside in the rain to get the newspaper it occurred to me that I could teach Laddie to retrieve the paper when it rained. That night I rolled up the paper with a rubber band around it and threw it across the living room. I told Laddie to "go get the paper" and he retrieved it. I did it a few more times to make sure he knew what to do. The next morning I stood at the doorway with Laddie and said "go get the paper". He went out the door and tried to pick the paper up. However it was folded flat so he could not grasp it in his mouth. He stuck his nose under the paper and flipped it straight up and then grabbed the paper in his mouth. He did that many times for me during his life, but what I remembered most was that when he trotted back with the paper, his head was held so high and he was so proud that he could do that for me. Although he was not a "show dog" type he was such an exceptional dog and a wonderful example of the Sheltie breed and their intelligence, loyalty and desire to please. Laddie was the type of dog that wanted to be around me all of the time. Later in his life when I lived in Pflugerville, I had an open type kitchen with sheet vinyl flooring. When ever I would clean the kitchen floor Laddie was trained to stay off the floor until I gave him the OK. He would usually lie down on the carpet in the adjoining room and watch me. Craig would sometimes stand on the opposite side of the kitchen and call him and try to get him to walk on the floors, but he would never do it. I wish I had more pictures of him. Below are two pictures of Laddie and my younger son Craig. When he was about nine and a half years old he began to lose weight and started coughing. I took him to the vet and he was diagnosed with lymph cancer. He hung on for about three more months and I finally made the decision to put him to rest. The Monday after father's days I took him to the vet so they could put him to sleep. The vet asked me if I wanted to go in the back with them when they put him to sleep. I couldn't do it and tried not to look at Laddie when they picked him up carried him to the back. He turned to look back at me and I looked at those sweet almond eyes for the last time.